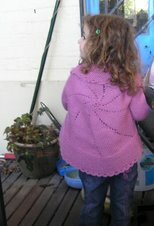 Bells' Long Lacy Summer unofficial KAL continues and there are some beautiful finished objects already. This is more work on the Fern Lace scarf, started about a week or so ago. The pattern is a repeat of twelve rows and I try to do some everyday. It's progressing, but slowly as I'm rationing my knitting time over several projects. I can at least see that the ball of wool is now definitely smaller than when I started. It took a lot of knitting for me to see a difference in the ball. I suppose I could weigh it to see how much was left. There was, I think, a bit over 400 metres in the skein. Sometimes I can knit one or two repeats and they go smoothly. It's not a difficult pattern at all and the arrowhead pattern comes from adjusting the start point on each row. Otherwise, the rows are identical. However, I find that some repeats I tink back often because I find the last few stitches are not right. I count but still make mistakes. Were I doing a shawl, I would have markers between pattern repeats, but there are really only fifty-four stitches I'm dealing with. It's nice and soft and will feel good to wear, although I bought it as sock wool. It's not a colour I normally wear near my face. Love all those gumleaf greens, olives, light browns, even khaki, but they don't suit my complexion. Still, a scarf may be OK. I ordered some Christmas gift books from the Book Depository. It has free postage worldwide and even with the current abysmal exchange rate I got good value. At the last minute, I added this book which is a reproduction of a much older book. It wasn't expensive at all, and I thought I would get some lace help from it. It has quite an introductory section which sounds vaguely old fashioned but I can see will be quite useful. 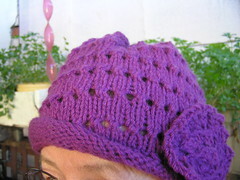 There are chapters and patterns for using two needles and also for circulars. I doubt I would make any of the actual patterns as they stand, I really am not into duchess sets, large supper cloths knit with silk or fine cotton and more along the same lines. However, there are definitely some patterns which could be adapted fora a stole, scarf, shawl etc. I bought that book recently. I just love it. It's a treasure. Your scarf is looking wonderful! gosh I can't remember which edition I found but in an odd antique sort of shop in narrabeen I got a lovely hardcover copy for $7 and gave it to my aunty who is a much more advanced knitter than myself!